THE WALL STREET JOURNAL AND BUSINESSWEEK BESTSELLER! 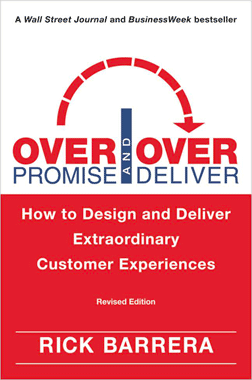 It’s an old cliché in business that smart companies UNDER promise and over deliver. But in today’s crowded market, that’s a one way ticket to oblivion! If you want to achieve extreme success for your business, you must reach for the extraordinary. Companies like American Girl, Lexus, Minute Clinic, Apple and Zipcar came out of nowhere to dominate their respective markets. How did they scoop their bigger and wealthier competitors? It wasn’t through larger marketing budgets. It was because they kept their promises! Not just any promises, but HUGE ambitious promises. In fact, these companies Overpromised to lure customers in—and then Overdelivered to keep them. Rick Barrera, a respected marketing consultant and business lecturer, has studied these word-of-mouth-driven successes and concluded that they are masters of what he calls TouchPoint Branding—the art of making sure that every point of contact between a company and its customers is aligned, well executed and fulfills an over-the-top brand promise. In the book Rick Barrera offers powerful and easy-to-apply lessons not only for senior managers at Fortune 500 companies or any company that wants to create Extraordinary Customer Experiences. Rick Barrera is a nationally acclaimed speaker, marketing consultant and author, known throughout the Fortune 500 for his extraordinary speaking events and his unique approach to brand building. His research on the strategies used by breakthrough brands will change your thinking about marketing forever. He has more than 25 years of in-the-trenches experience helping hundreds of companies re-design their systems and implement a holistic approach to serving customers. His impressive client list includes Intel, IBM, Abbott Labs, AutoZone, Bayer, Caterpillar, Merrill Lynch, and Verizon. Rick’s previous books include Non-Manipulative Selling, Dollars and Sense of Exceptional Service Delivery and Collaborative Selling. Copyright 2019 • RBA Associates, Inc.